In July of this year, HSP undertook a project to survey its microform holdings. Microform includes both microfilm and microfiche. 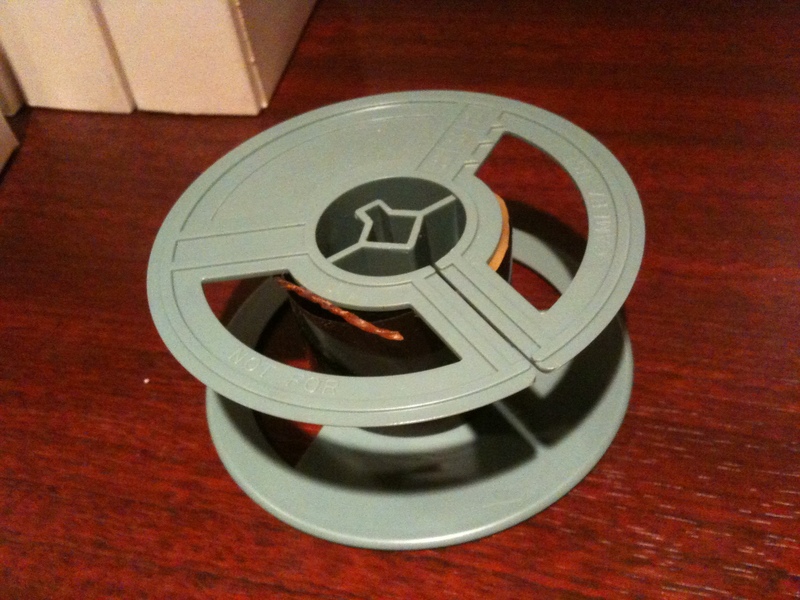 Microfilm is like 35mm film, while microfiche is tiny images on a sheet of paper. 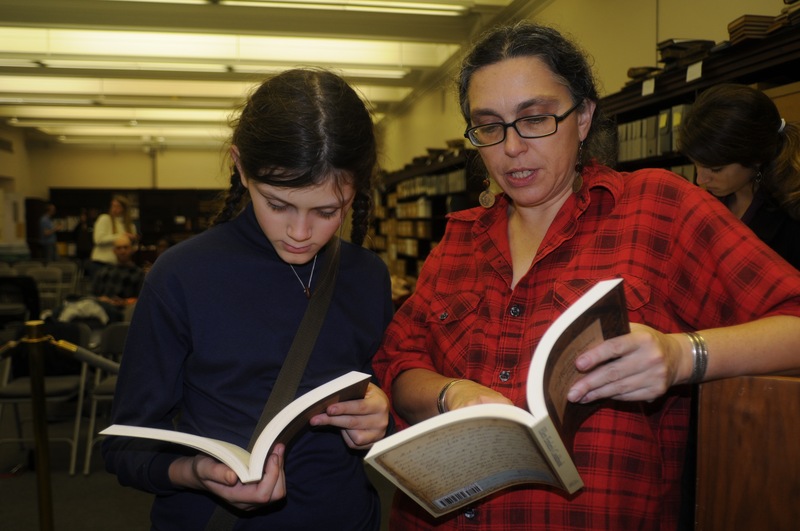 HSP holds approximately 23,000 microfilm reels and 10,000 microfiche leaves, including facsimiles of serials, vital records, manuscript collections, and other materials. 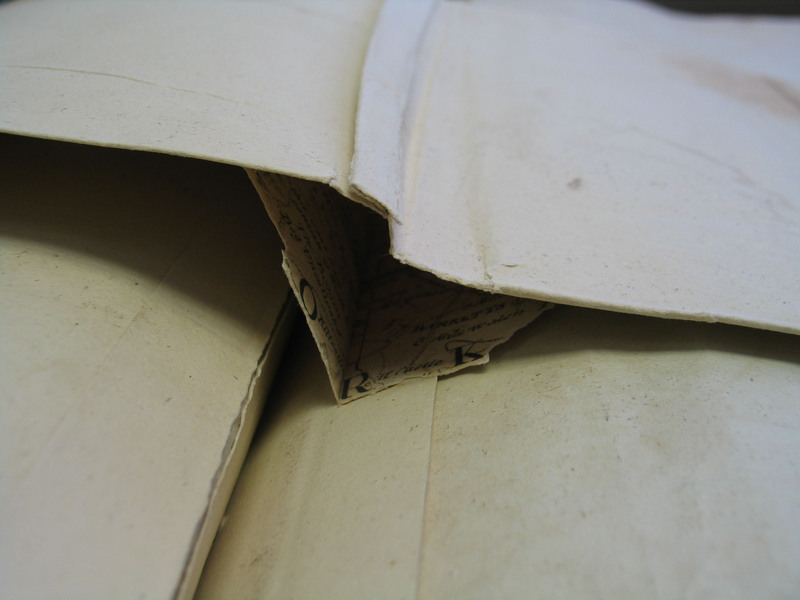 This project has two primary objectives: 1) compiling an inventory of the microform holdings and related data, including physical condition, image quality, intellectual property status, whether materials has already been digitized elsewhere, and other factors; 2) as time permits, I will assess select microform’s suitability for digitization based on physical condition and intellectual property concerns. So, where did I start with this project? I began by combining two already existing databases, and updating the new one with fields that help to describe the metadata that HSP wants to collect (physical condition, image quality, intellectual property status, etc). I also took note of the various locations around HSP where there is microfilm (there is film on 4 of our 5 floors!). My day to day work includes working with film from one of these spaces. I either create or update a record for each film or set of films (collections). I check each individual reel for physical condition and image quality. 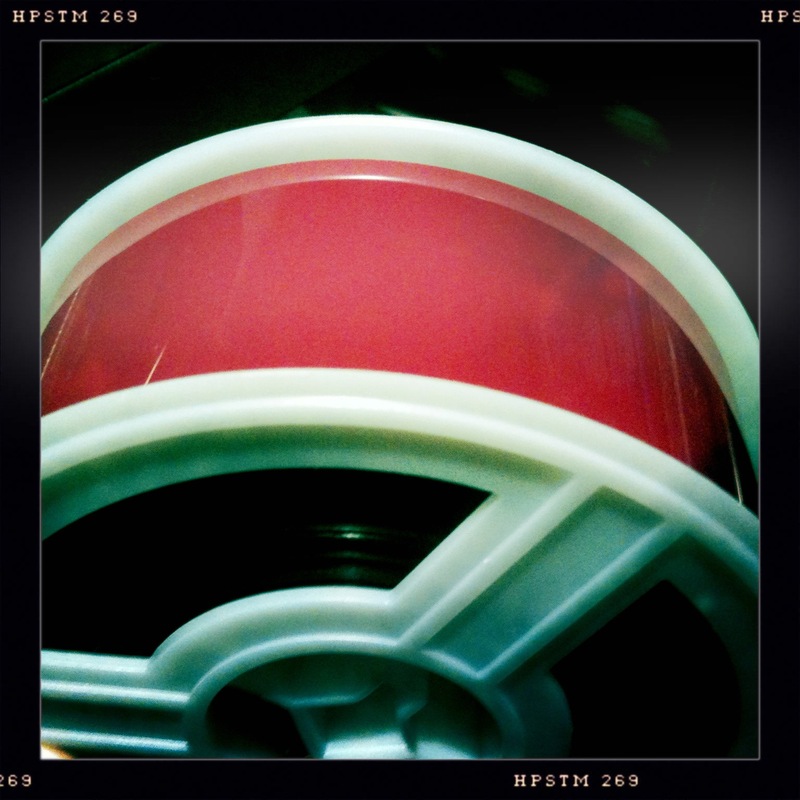 When there are many reels in a collection, I “spot check”– choosing films from the beginning and end of the collection. In some cases, the collections are quite large, and have been filmed at various points over time. An example of this is the Philadelphia Inquirer, which was filmed in sets over the course of many years. When something like this occurs, I make sure to “spot check” film from each date. One fun part of this job is getting to see the fun colored film that different film companies have used – I have seen blues, red, pinks, and yellow, among others. What obstacles have I come across during my work? For the most part, the largest obstacle I have run into has been preservation problems. The main preservation problems with microform include degradation (usually redox blemishes – colored dots from oxidation), vinegar syndrome, and discoloration of the film. Vinegar syndrome refers to the smell from the off-gassing and decay of the film, which over time also degrades the film so that it comes brittle and fragile. 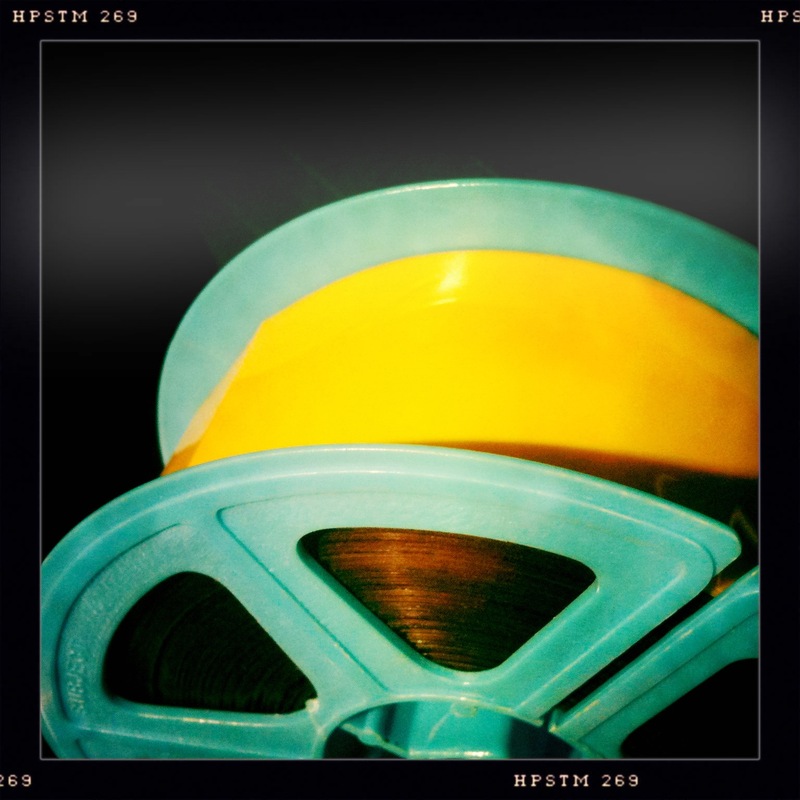 Other preservation problems stem from eroding tape or rubber bands that have been used to keep the film from unspooling. 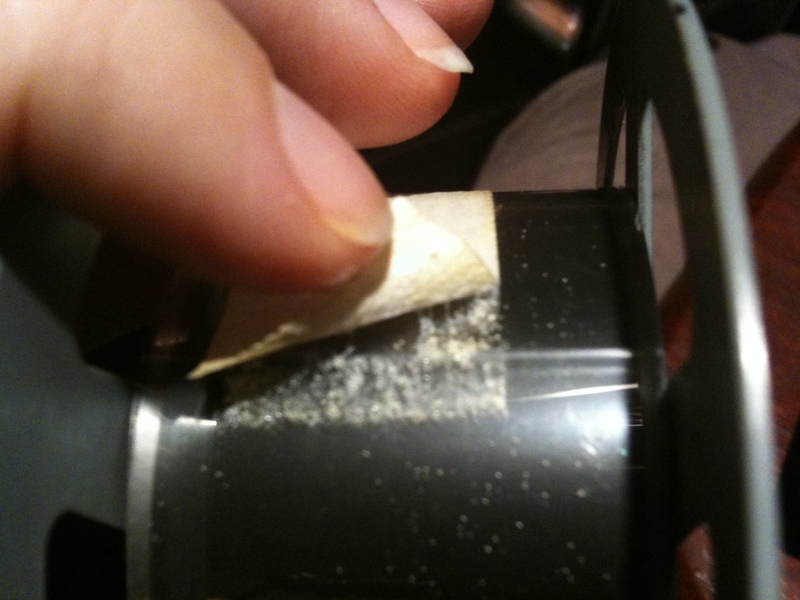 In these pictures, you can see how the tape leaves residue on the film. 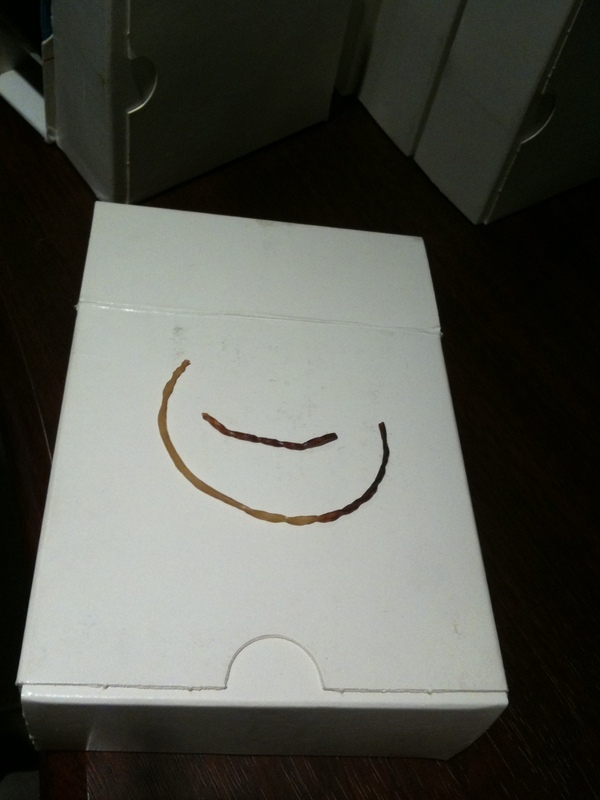 You can also see how an old rubber band holds onto the film, and breaks when taken off. The great news is that the progress of this project is on target. At the end of the six-month project, in late January, there will be a complete inventory of the microform holdings at HSP, ready to be used for reference work and to be consulted for digital projects in the future. 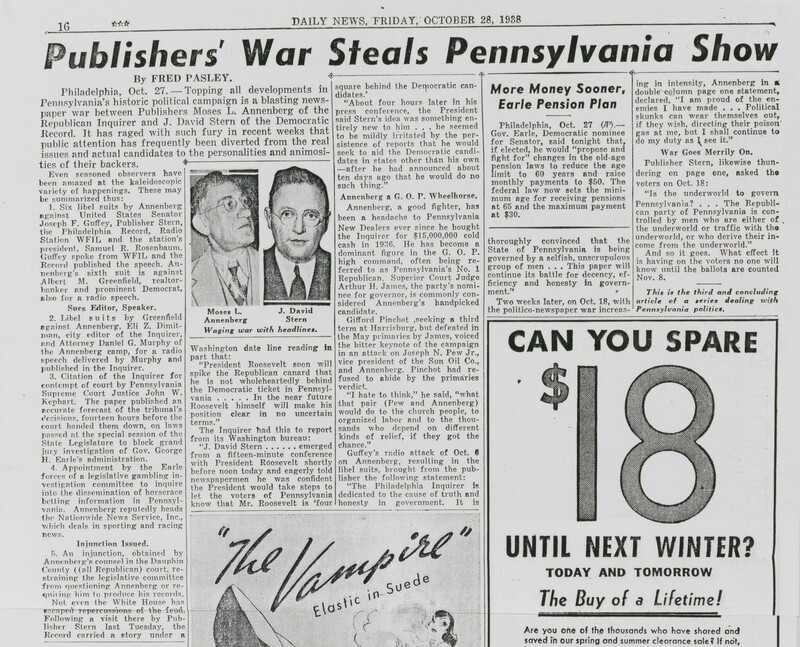 Several years after its failure, Bankers Trust Company became entangled in a ‘publishers’ war’ which pitted two of Philadelphia’s most prominent newspapers against each other: The Philadelphia Inquirer and the Philadelphia Record. The larger backdrop for this conflict was the vicious political battle raging in the city as well as the rest of the Commonwealth of Pennsylvania as Democrats, for the first time in years, began to wrest control of government from the Republican Party. George Earle III, elected Pennsylvania’s governor in November 1934, was the first Democrat to be elected to the position in 40 years. In the summer of 1937 Moses Annenberg, staunch Republican and owner of The Philadelphia Inquirer, began to use his newspaper to attack Albert M. Greenfield. For years a backer of the Republican Party, Greenfield had by this time switched his allegiance to the Democrats and worked ardently to see them gain control of the government. Greenfield’s political involvement as well as the fact that he was the chief financial backer of The Inquirer’s rival Democratic paper, The Record, made him a prime target. Annenberg used these attacks as a way to discredit The Record, Greenfield, and others affiliated with the Democratic Party. J. David Stern, owner of The Record, and Greenfield did their best to reciprocate. In the former address, Murphy accused the Earle administration and its backers of corruption, claiming that the State Banking Department had given preferential treatment to Greenfield and his associates who still owed millions of dollars to closed banks, including Bankers Trust Company. In the second, Murphy contested that Greenfield had known about the bank’s impending failure, and had one of his firms withdraw $300,000 from the bank five days before it closed. 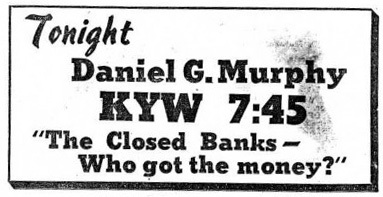 The Inquirer gave the radio address full coverage, reproducing Murphy’s statement and including a photo-static copy of the check showing the supposed withdrawn funds. 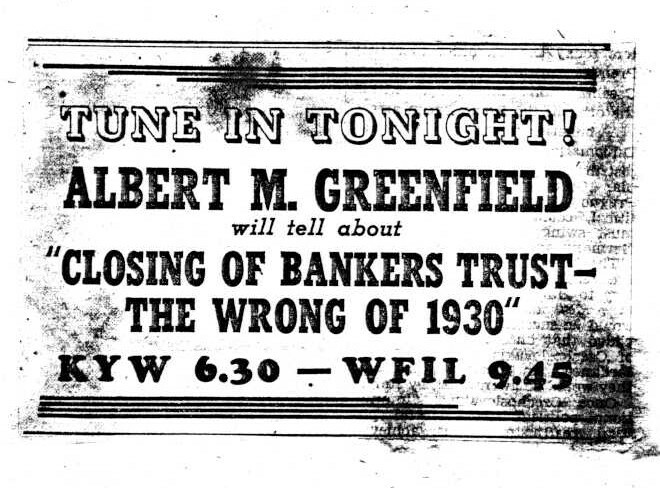 Greenfield refuted these claims in a radio address, entitled “The Closing of Bankers Trust- the wrong of 1930.” This marked the first time that Greenfield had spoken publicly about the bank and his affiliation with it since its closure. 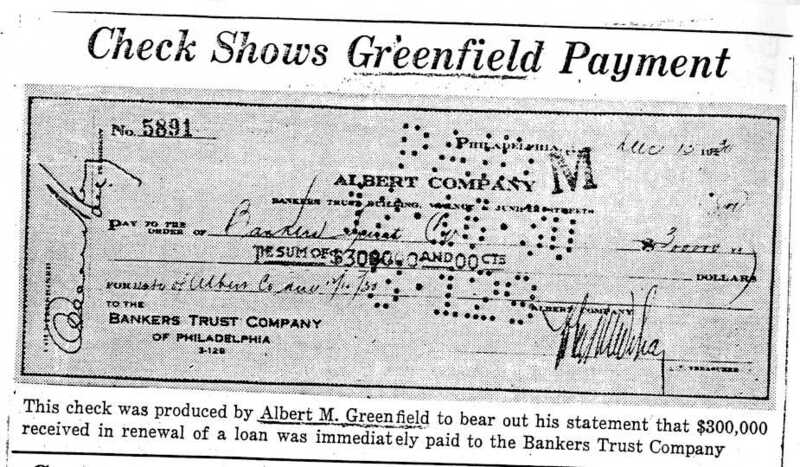 Greenfield argued that his real estate firm, the Albert Company, paid Bankers Trust $300,000 for a loan it had received shortly before the bank closed. Besides radio addresses, Greenfield bought newspaper ads denouncing Murphy and Annenberg. The Record also began to print slanderous articles about The Inquirer owner, including charges that he was involved in illegal horse betting. 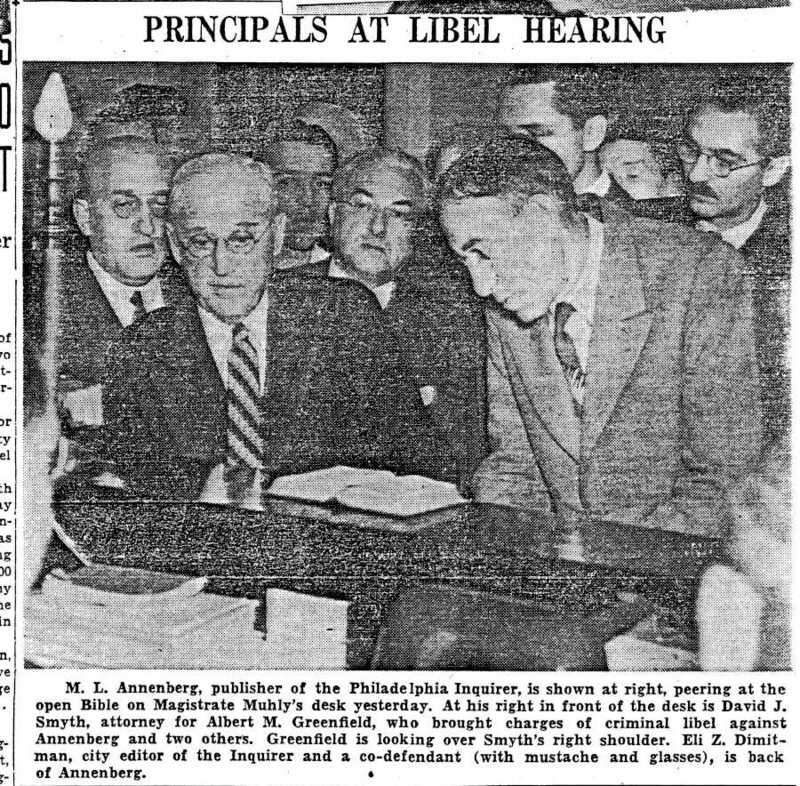 Annenberg and Greenfield ultimately sued each other for libel, but the suits were withdrawn in May 1939 with the signing of mutual public apologies. The story of Bankers Trust Company is being documented as part of the Greenfield digital project. The project is set to launch by the end of 2012. November 28, 2011 by Cary H.
Animals + archived images = Pets-In-Collections! 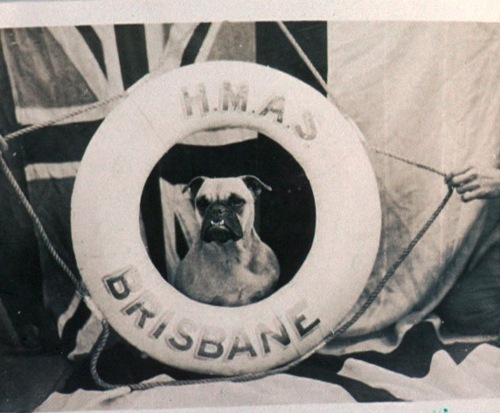 If you like animals and old pictures, then Pets-In-Collections might be just for you! This Tumblr site was recently started by librarians at Bryn Mawr College, and several local (and now international!) organizations have contributed pictures, including HSP, the Free Library of Philadelphia, the Independence Seaport Museum, and Villanova University. It’s really simple to submit your own images; just check out the site and follow the directions. A new picture is posted each day and it’s a fun site to follow. Enjoy! 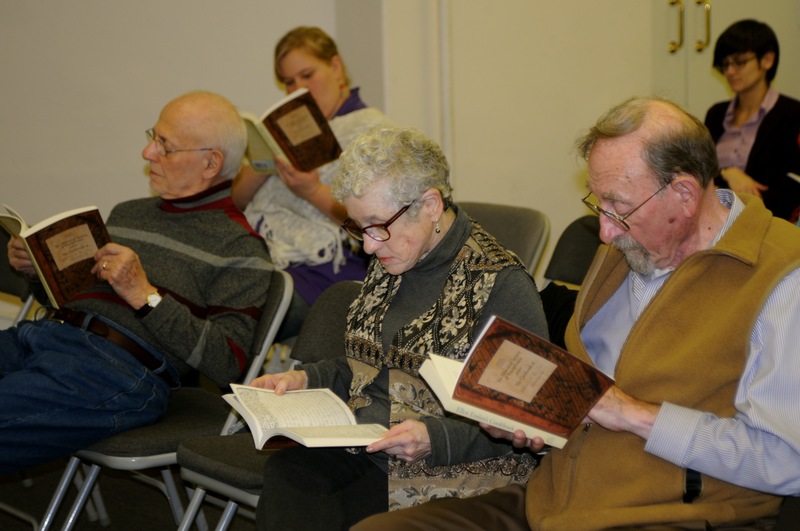 Last Wednesday Nov 16th, HSP celebrated the publishing of Ellen Emlen’s Cookbook. Sound familiar? That’s because we posted about it here. 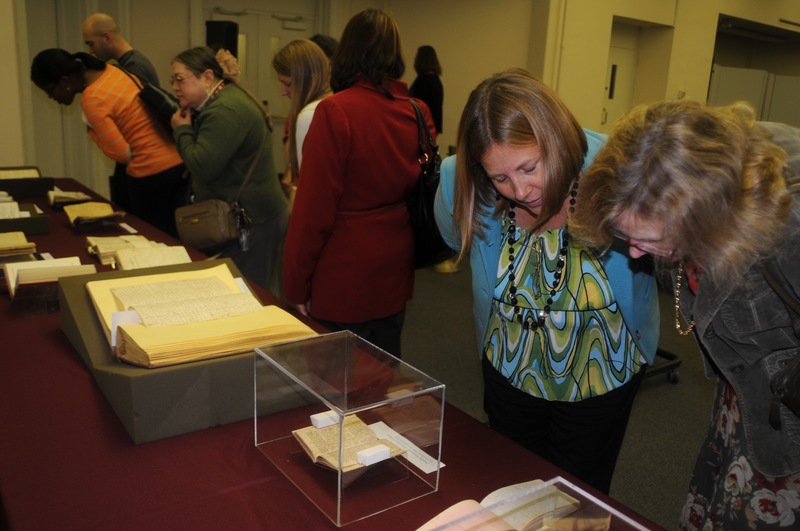 The event included a display of our historical cookbooks from the collection, including Martha Washington’s cookbook, both of the Mrs. Penn’s cookbooks, a 2nd edition of Amelia Simmons’ book printed 1808 as well as the original manuscript cookbook from Ellen Emlen. I spoke about the conservation of the original work as well as some of the learning opportunities to be found in the book. Jennifer McGlinn joined us as well. 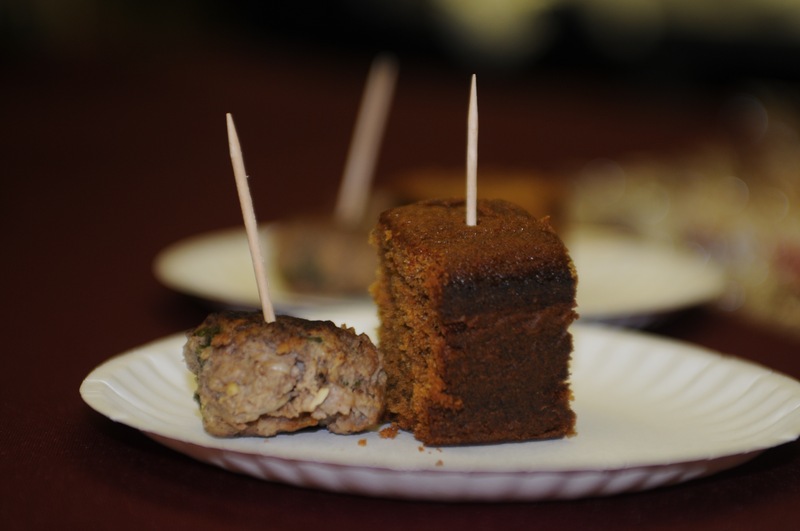 She cooked the meatballs, gingerbread and Mr. Atherton’s punch. She also spoke of the history of gingerbread and gave us tips for working with historical recipes. Jennifer has generously shared the transcribed recipes with us and they are posted here. Make sure to reference your copy of the facsimile! Mrs. Emlen has edited this recipe from the original writing. She called for one tablespoon of ground allspice, but then writing in a heavier pen, “I’ve only put a tea[spoon].” I think she was quite right; a whole tablespoon would have been too strong, here. I have added a heaping teaspoon to this version. I have also slightly altered the amount of baking soda she suggests. This is a very large cake with lots of acid in the form of molasses and sour cream. Using one-and-three-quarters teaspoons of soda creates the right amount of leavening. The addition of salt is yet another variation. We add salt to just about every cake and cookie these days, and for good reason. It buoys the flavor of the other ingredients and makes the final sweet product sweeter and more flavorful. Salt was rarely added to nineteenth-century baked goods. I believe it to be a necessary addition here. As for the sour cream, here, again, Mrs. Emlen originally incorporated milk into the cake, but added a note, again in a heavier pen, that “sour cream is better.” I think she was correct. The thickness and tartness of the sour cream heightens the flavor and helps to create a soft cake with a delicate crumb. It should be noted, as well, that the original recipe called for combining the baking soda and milk (or sour cream) before adding it to the other ingredients. Using today’s baking soda, it is just fine to whisk it into the dry ingredients as we do with most cake and cookie recipes. Finally, Mrs. Emlen’s recipe calls for a “wineglass of brandy.” Earlier in the century and quite probably up until Mrs. Emlen’s time, a wineglass referred a small amount, about one-quarter cup. This batter is very thick, however, and really needs more of what we would consider a substantial wineglass—one cup. You can use all brandy if you like, but I found that incorporating a bit of brandy along with apple juice, cider, or even better, a spiced cider (try Trader Joe’s brand), adds a lot of flavor to the finished cake. Despite the size of this gingerbread, it only requires about forty minutes in the oven. Serve it plain or with lightly sweetened whipped cream or ice cream. Preheat the oven to 350ºF. Butter and flour a 9-by-13-by-2-inch baking pan (nonstick is useful here). Whisk together the flour, baking soda, salt, ginger, cinnamon, and allspice in a large bowl. Combine the butter and sugar in the bowl of an electric stand mixer fitted with the paddle attachment (or in a large bowl, using an electric hand mixer) and beat on medium speed until smooth, light, and fluffy. Add the eggs, one at a time, incorporating each one thoroughly before adding the next. Add the molasses, mixing until combined. Reduce the mixing speed and add about one-quarter of the flour mixture, beating until smooth. Alternately add the juice, sour cream, and the remaining flour, ending with the flour and stopping occasionally to scrape the sides of the bowl, until the batter is smooth. Pour the batter into the prepared pan and bake until the cake has risen, is golden brown, and a wooden skewer inserted in the center comes out clean, about 40 minutes. Set the pan on a wire rack for about 10 minutes before turning out the cake to cool completely on the rack. These meatballs, originally prepared in the nineteenth century with leftover cooked rare meat, prove quite successful when made with fresh ground beef. Typical of the period, Mrs. Emlen’s recipe given to her by Mrs. Wharton calls not only for herbs, bread soaked in milk, and onion, but also ground or freshly grated nutmeg and lemon zest and juice. The latter, while particularly unfamiliar to many of today’s cooks, is splendid here, contributing a brightness and freshness to the flavorful meat. Brown these meatballs simply in a bit of olive oil, or, if you wish, dip them first in egg and then dredge them in breadcrumbs, as Mrs. Emlen suggests in a preceding recipe for chicken and oyster croquettes. This recipe calls for shaping the meatballs into walnut-size rounds, but of course, you can make them any size you wish. Combine the bread and milk in a small bowl, soaking the bread completely. Set aside until the milk is absorbed, about 3 minutes. Combine the beef, parsley, onion, nutmeg, salt, pepper, egg, and lemon zest and juice in a large bowl, gently mixing to incorporate all of the ingredients. Form the mixture into walnut-size balls (about 30). Heat about 1 tablespoon of olive oil in a large sauté pan over medium heat. Place some of the meatballs in the pan, leaving about 1/2 to 1 inch in between each one, and cook until browned on the bottoms, about 5 minutes. Turn the meatballs and cook until firm (fully cooked) and browned on the other sides, 3 to 5 minutes. Transfer the meatballs to a paper towel-lined baking sheet and set aside to keep warm. Clean the pan, if necessary, and heat additional olive oil to cook the remaining meatballs in the same manner. The following recipe is based upon Mrs. Emlen’s (originally Mr. Atherton’s) own with several alterations. First, she calls for preparing twice this amount, which produces nearly a gallon of punch. Next, I have reduced the amount of brandy and rum she called for; add it all if you wish, but it is quite strong prepared this way. Finally, I have not only used lemon zest here, but sliced lemons and juice, as well. Relying on only lemon zest makes for a very strong and bitter final product. Adding the juice along with lemon slices results in a punch that quite like a refreshing spiked lemonade. This punch can, indeed, sit aside in the refrigerator for a while, but I wouldn’t recommend steeping the zest and lemon slices in it for more than a couple of hours, as it will grow too bitter. In addition, after about seven hours or so in the refrigerator, the lemon loses its freshness and brightness. Bring the water to a boil in a medium saucepan. Remove from the heat and add the brandy and rum. Zest and juice 3 of the lemons and add to the water and liquor mixture. Slice the remaining 2 lemons into thin rounds and add to the mixture. Using your hands (use gloves, if necessary), squeeze the lemons to extract as much juice as possible. Add the sugar, stirring to dissolve. Add more sugar, if necessary. Set the punch aside in the refrigerator for about 30 minutes to 1 hour. Strain and chill until ready to serve. 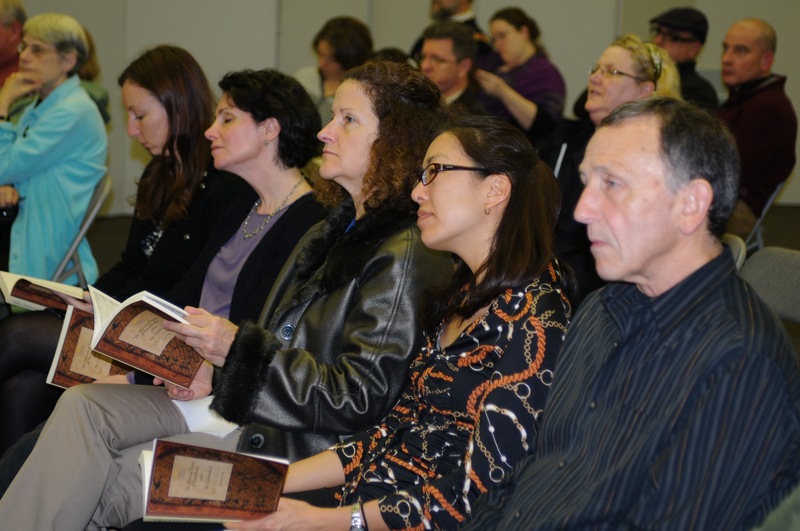 We would also like to thank the over 50 people who attended the event. 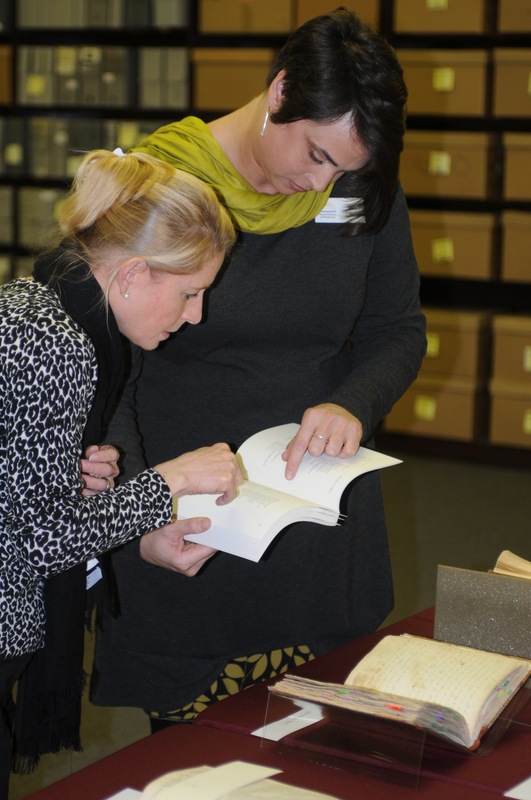 Jennifer McGlinn (left) and Tara O’Brien (right) referencing the original Ellen Emlen manuscript (on the table) to the printed facsimile (in hands). Johann Conrad Weiser lived in Pennsylvania in the early 1700s and is mostly known for his role in shaping the history of colonial America through his work as an “Indian affairs agent.” He lived quite a busy and remarkable life, although perhaps everyone who crossed an ocean to live on a continent entirely unknown for most of their culture’s history is worth marking more than once. His father was part of a group of German immigrants to North America who swore loyalty to the English crown, a fealty that Weiser would enthusiastically maintain. When he was 16 his father made an agreement with a local Mohawk chief and sent young Conrad to spend a winter with the tribe, learning their language and customs. Weiser would later move to Pennsylvania and begin working for a series of governors, in theory as an Indian affairs agent, helping to prevent violence between Native tribes and colonists and brokering land “sales,” but in reality doing much more. During the French and Indian War (or the North American part of Seven Years War, depending on your geographical perspective) he was a lieutenant. He commanded an underfed but fierce militia of colonists while still maintaining diplomatic relations with the Six Nations, a united group of Iroquois or Haudenosaunee (Mohawks, Oneidas, Onondagas, Cayugas, Senecas, and Tuscaroras). He also helped to found Reading, Pennsylvania and Berks County, and was Berks County’s chief judge from 1752 until 1760. In addition to his civic duties, he was a teacher and minister in the Lutheran Church, although he spent a few years living at the Ephrata Cloister in Lancaster County. Now that I’ve introduced you to Conrad Weiser, I’ll let some of his records speak for themselves. 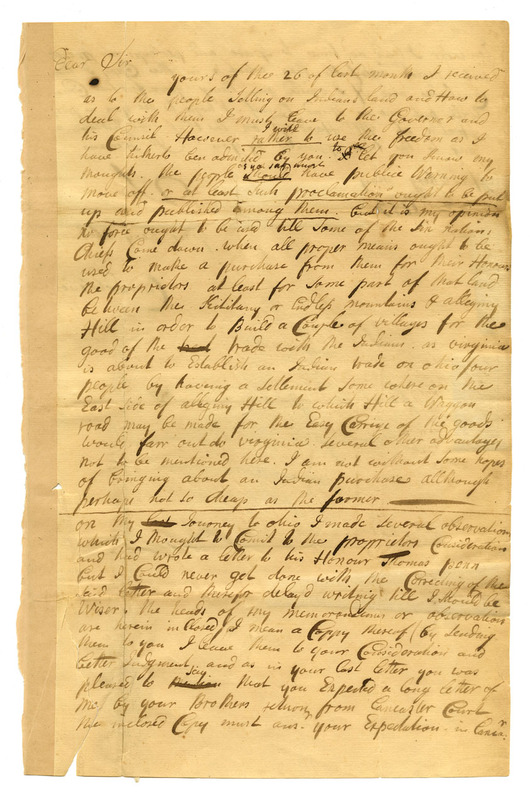 In this item, Weiser argues to his friend and secretary to the governor of Pennsylvania, Richard Peters, that all tribes should be given warning long before their land is sold and be given adequate time to leave it before European settlers move in. But ideally, he adds, land should only be bought and sold during visits from the Six Nations’ chiefs and only with their consent. These opinions seem less than moderate to us, but his sympathy for the local tribes would eventually lead to accusations of disloyalty and of his being a traitor to the English crown. 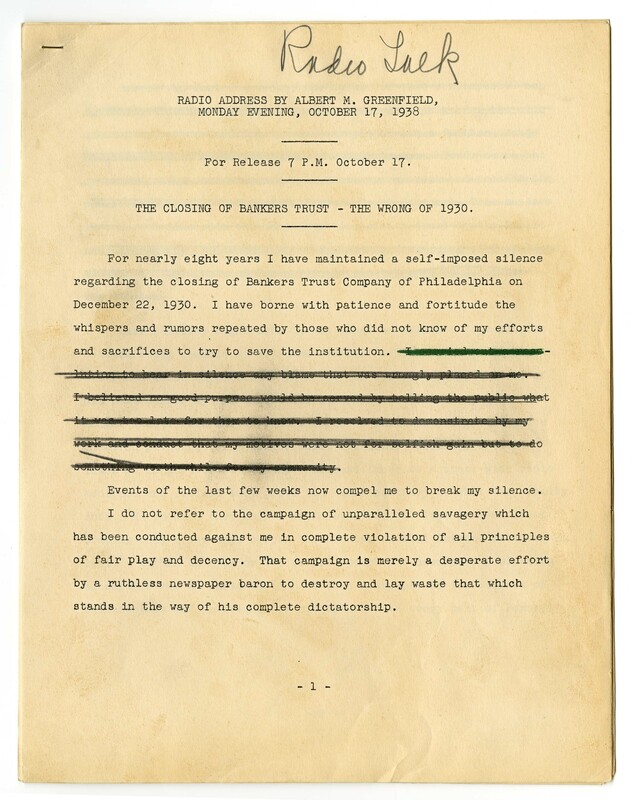 Throughout the correspondence in this collection, Weiser makes references to lies and rumors being spread about him, and is eventually forced to defend himself against charges of disloyalty and in one instance, against an armed mob. In this account of a hostile meeting between Weiser and a gathering of townspeople, he describes how they react when he first escorts a party of Native men safely to lodgings for the night (guarding them from a large, angry throng) and then tries to draft volunteers for a militia. The townspeople are riled after hearing rumors that a colonist was murdered by a Native American man, so the meeting quickly escalates to threats of violence. Given Weiser’s staunch support of the English crown, the final item in the collection was a bit of a surprise to me. 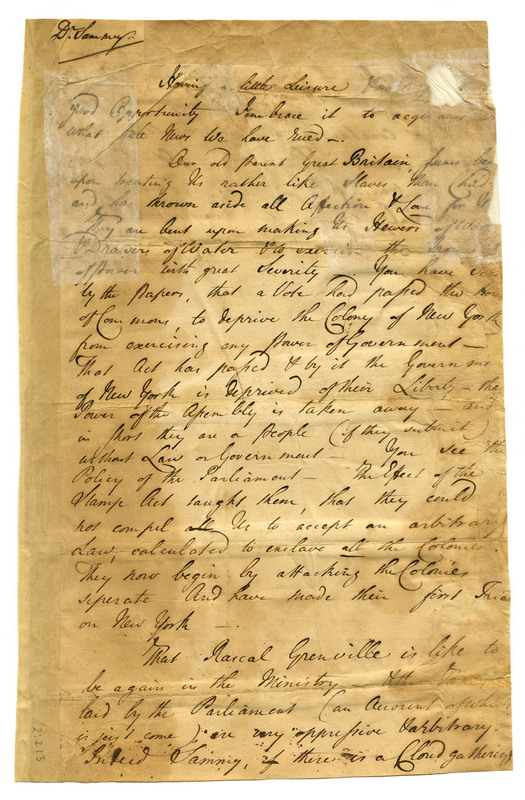 This letter was written well after Weiser’s death, from James Biddle, a friend of the family to Weiser’s son, Samuel Weiser. The letter is unfortunately damaged and missing some of its right hand side, but the sentiment comes through clearly. Biddle is warning Samuel Weiser that Great Britain is no longer the trusted, benevolent protector that it was only decades ago. This collection offers a surprisingly varied view into this period in Pennsylvania history. In addition to correspondence, it also includes muster rolls, lists of men who died in conflicts with French forces, receipts and expenses for diplomatic trips, and depositions for cases Weiser heard as a Berks County judge (including testimony of domestic violence, accusations of slander, and a colonist alleging that a Nanticoke man sexually assaulted his daughter). 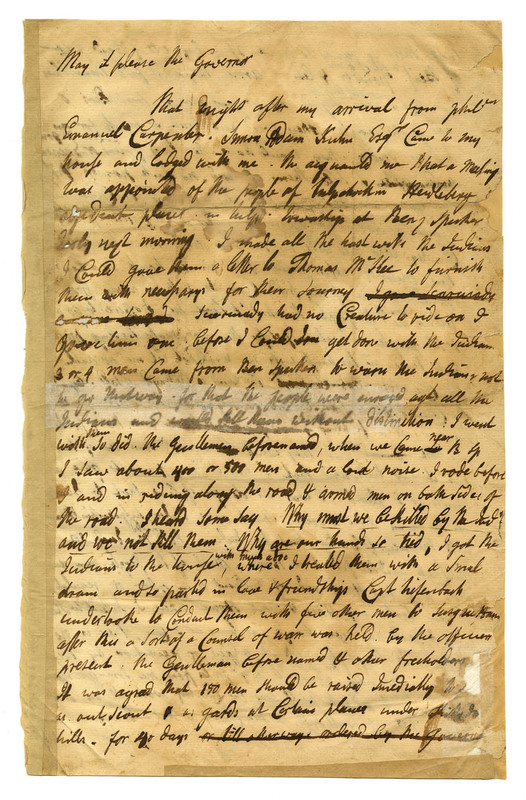 These papers document a period of time in United States history from which relatively little written material survives. But more interestingly, they describe the interactions between colonists and Native peoples from the point of view of a man who was sympathetic to but complicit in their systematic exploitation. Weiser’s papers surprised me with their sincerity — the genuine respect that he has for the Native men and women and the seriousness with which he takes his responsibility to them come through in his letters. This is undoubtedly one of the most historically and socially important collections that I’ve had a chance to work with as a processing archivist, and I’m especially glad that because it’s part of the DCA2 project, it will soon be available online to more users than could access it through the Historical Society’s reading room. This past weekend I attended a Guild of Bookworkers, Delaware Chapter workshop taught by Pamela Spitzmueller. Pam is the first James W. Needham Chief Conservator for Special Collections in the University Library and the College Library at Harvard University. The workshop was to inform us about considerations that must be taken into account with folded items within an atlas structure. 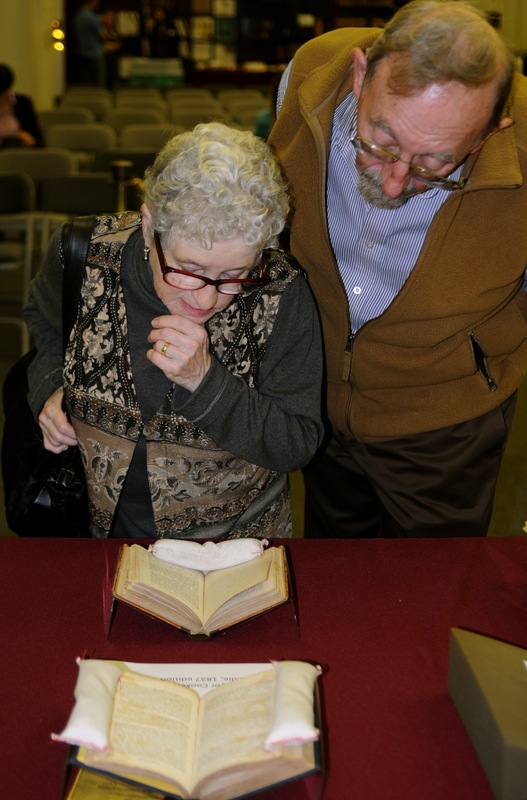 This workshop was important for us, not only because we have so many maps in book as well as atlases, but also for all of the genealogical charts! 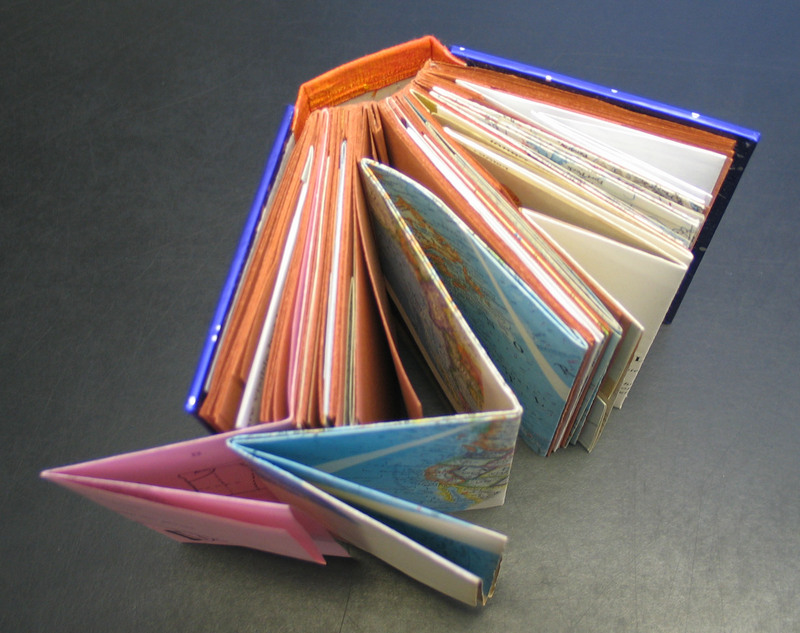 Each participant in the GBW workshop completed a 3×5 sample book of different kinds of folds as well as several models of other books. 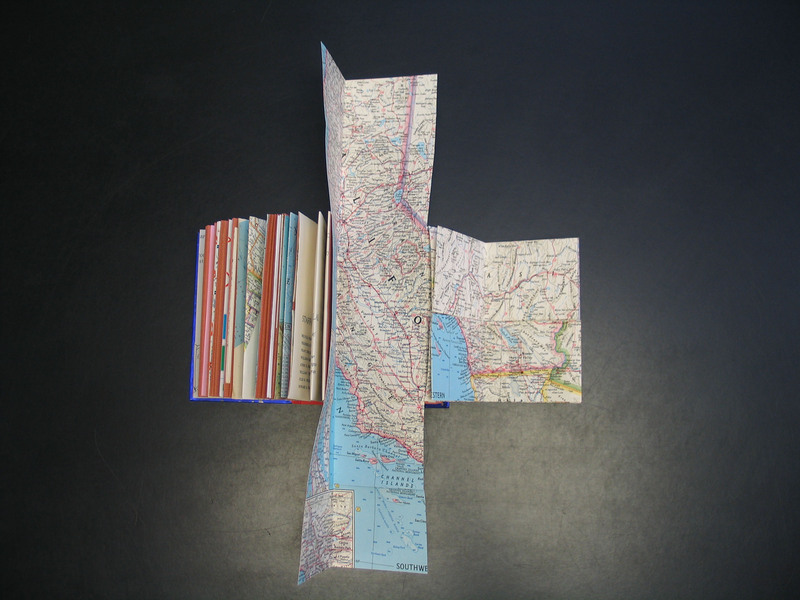 The workshop was great for bringing awareness to what can go wrong when maps are folded into books. 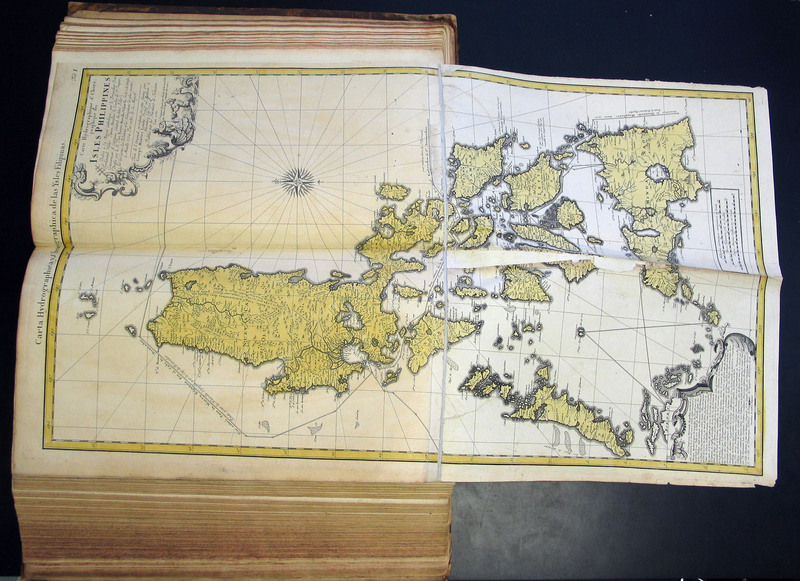 When I got back on Monday I was excited to pull some of our older atlases and take a look at them with a fresh eye. 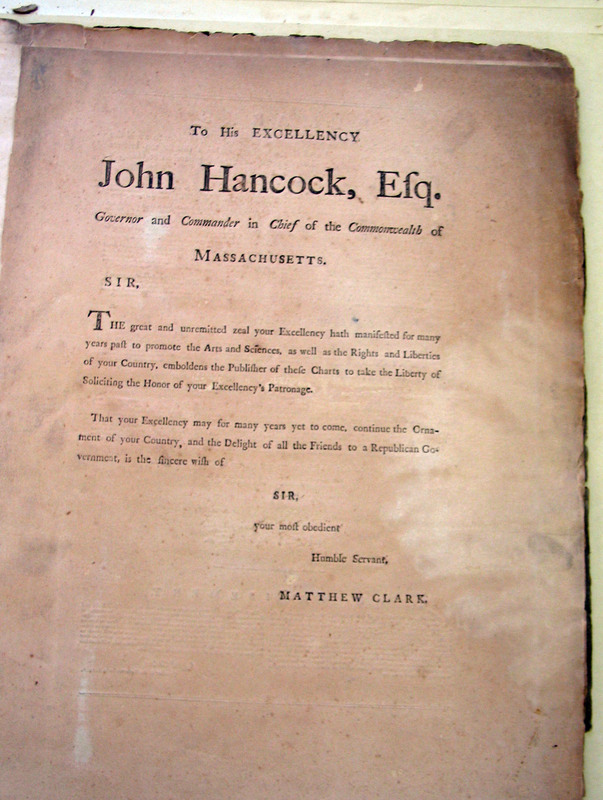 One of my favorites is this “Atlas” presented to John Hancock, Esq. Yes, THE John Hancock. 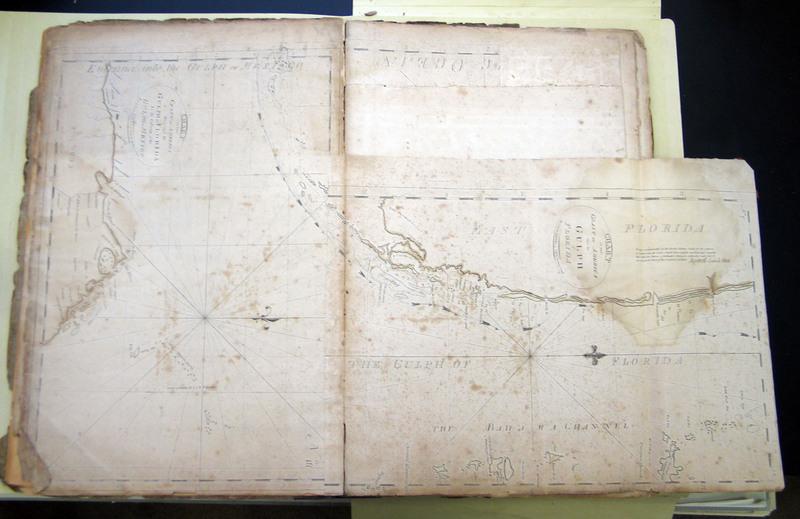 This is a large volume with maps showing the coastline from Maine to Florida. It gives information about how to avoid the gulf stream as well as some of the more treacherous shoals. 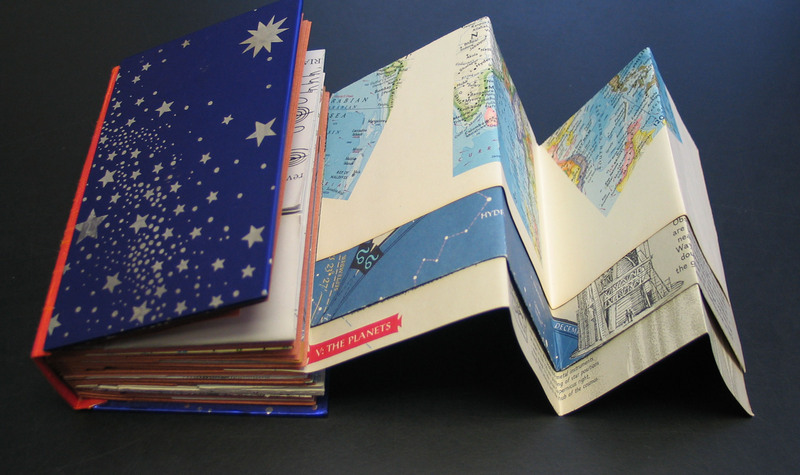 The book is made up of the maps which have been printed on several different sizes of paper. Some of them fold out, some do not. A label on the front says 1780. 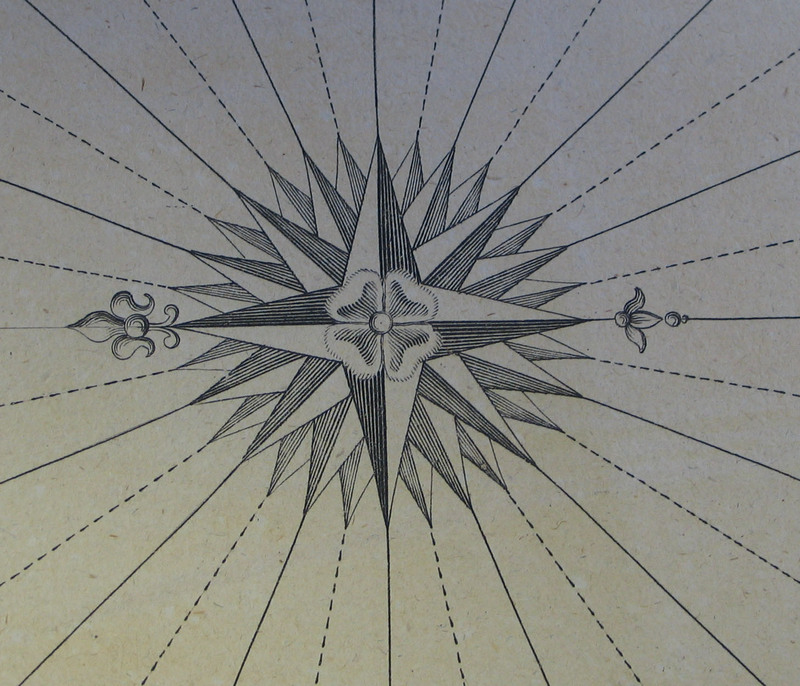 Inside the book are some fantastic engravings. This map of Minorca is beautifully designed. 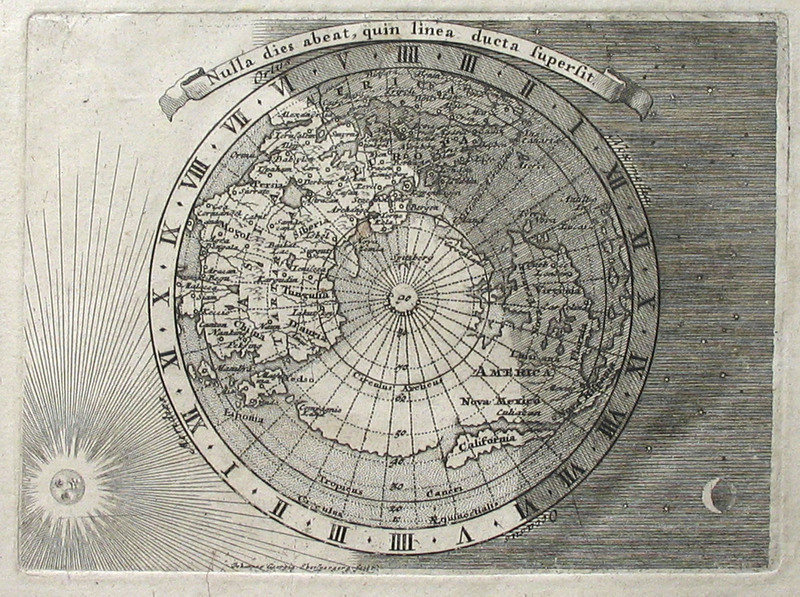 It includes a larger map in the upper left, a view of the harbor in the upper right, the actual island in the middle and two elevations of different cities in the bottom right and left. 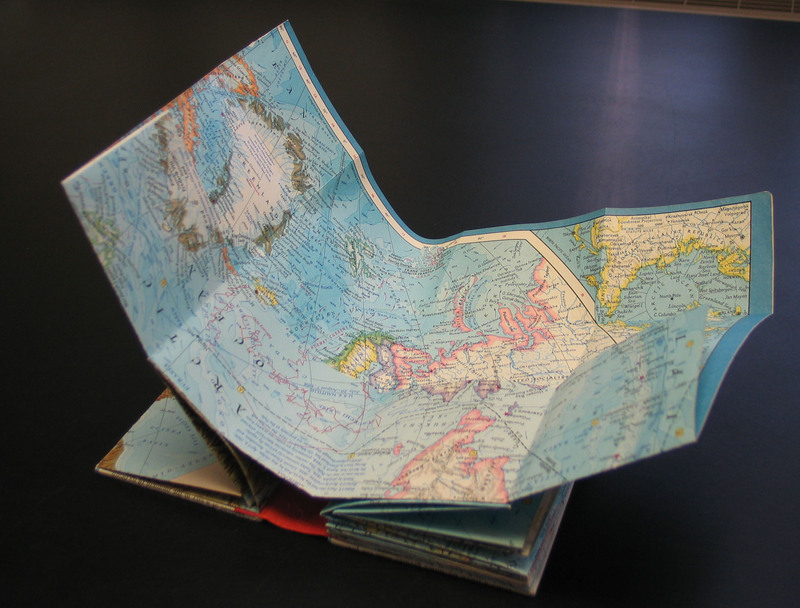 This map is printed on one sheet of paper which is folded in half and glued to a tab. 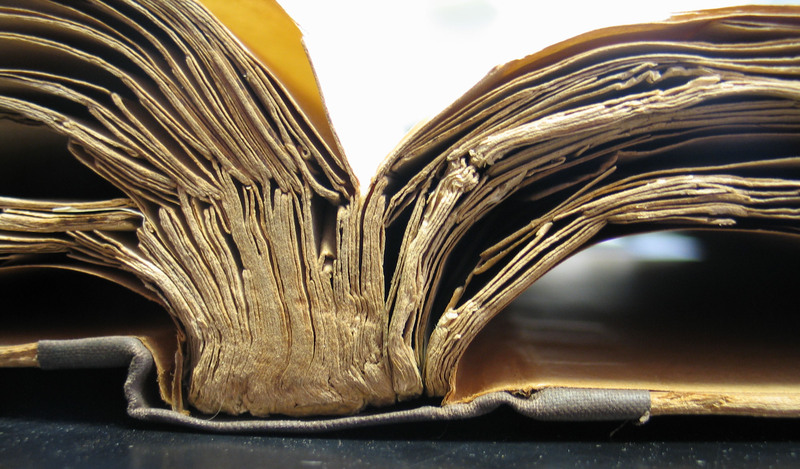 The tab is what is sewn into the spine and binding of the book. 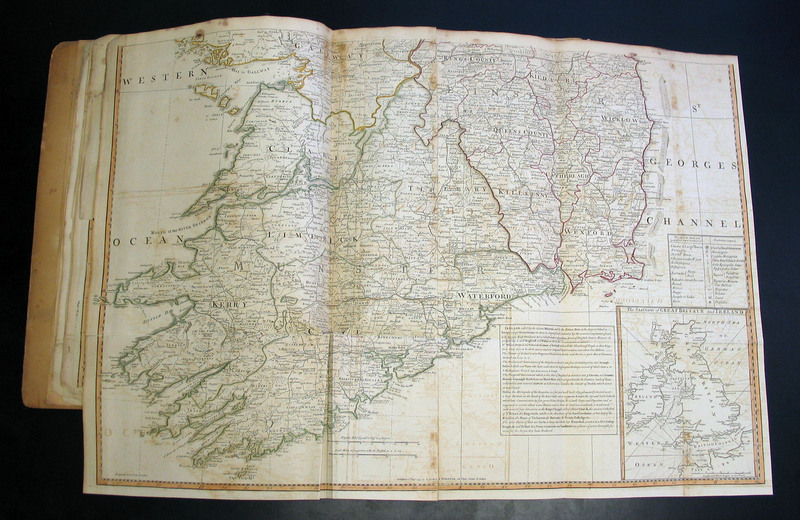 after opening: between Kerry and Waterford you should be able to read Cork. 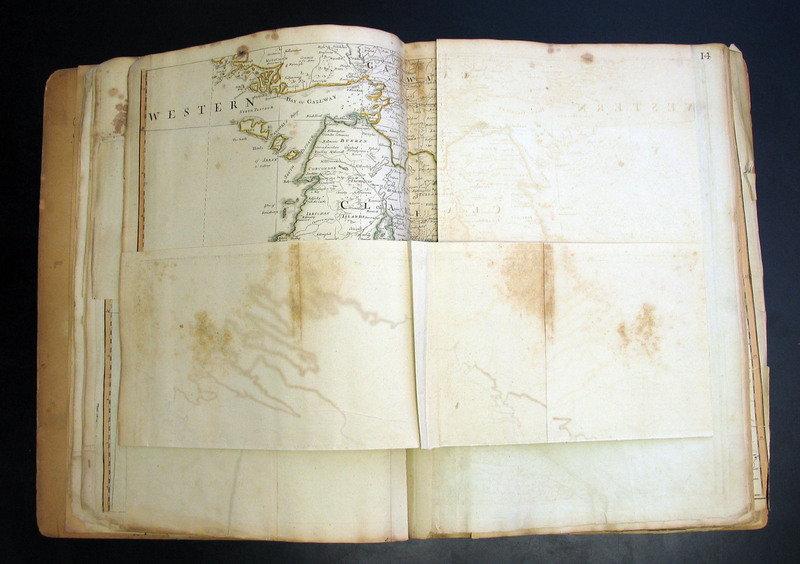 However, that area shows typical damage of a folded map tipped in too closely to the spine. 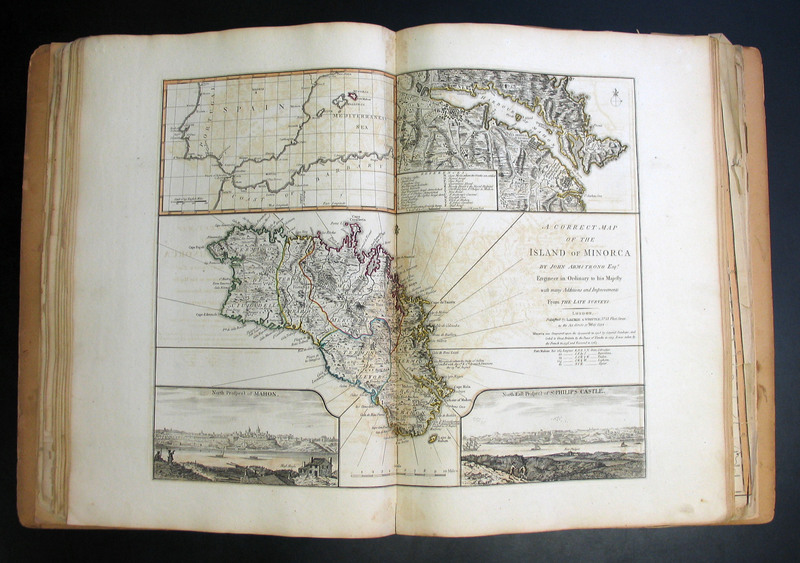 And finally another atlas, the Altas Geographicus Maior, 1759-1762, is much thicker than either of the previous books. 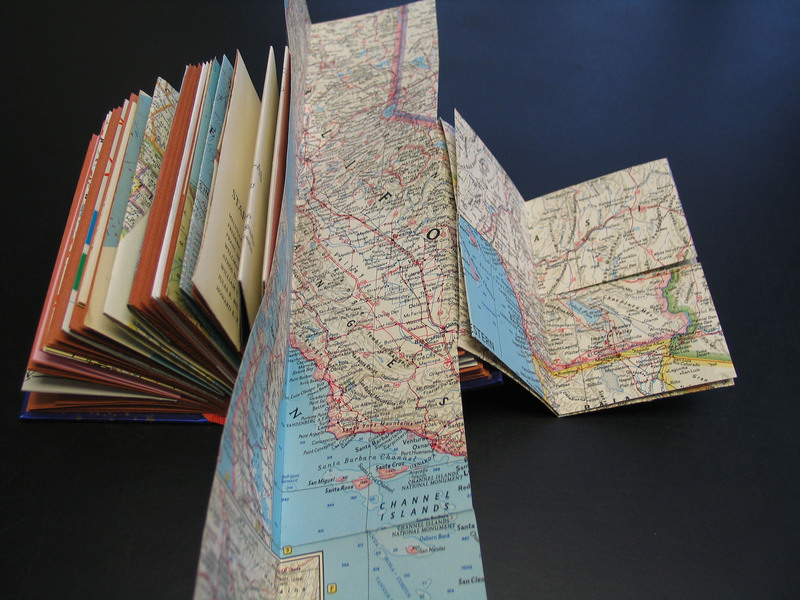 It contains maps which fold out in various directions. Including this one of the “Filipines”. 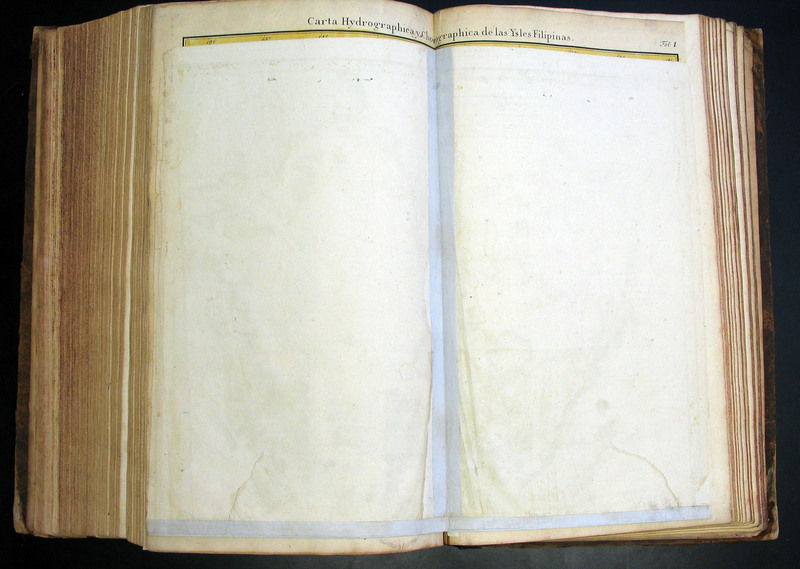 It is possible to see where the folding has damaged the book in both of these images. 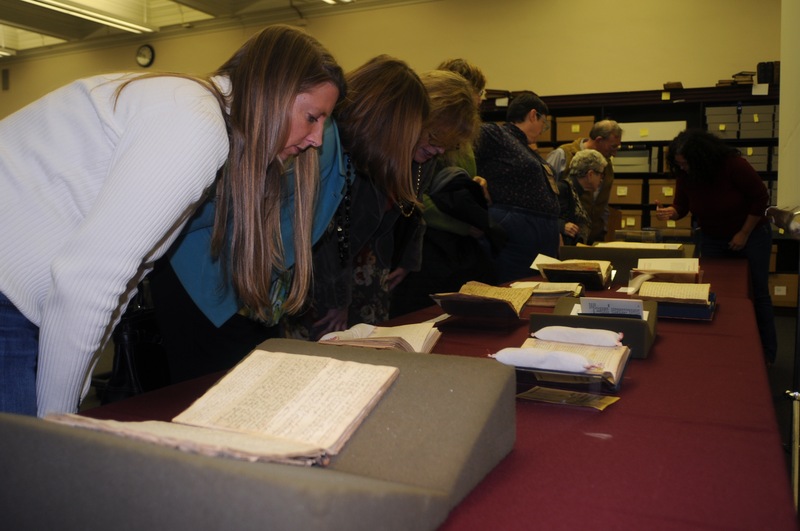 Last week, Cary wrote here about the end of the PACSCL Hidden Collections Processing Project at HSP. While she was composing that post, two local news organs were covering one of the HSP collections that the PACSCL team processed. The Harold E. Cox transportation collection caught reporters’ attention because of an unusual stipulation from the donor. 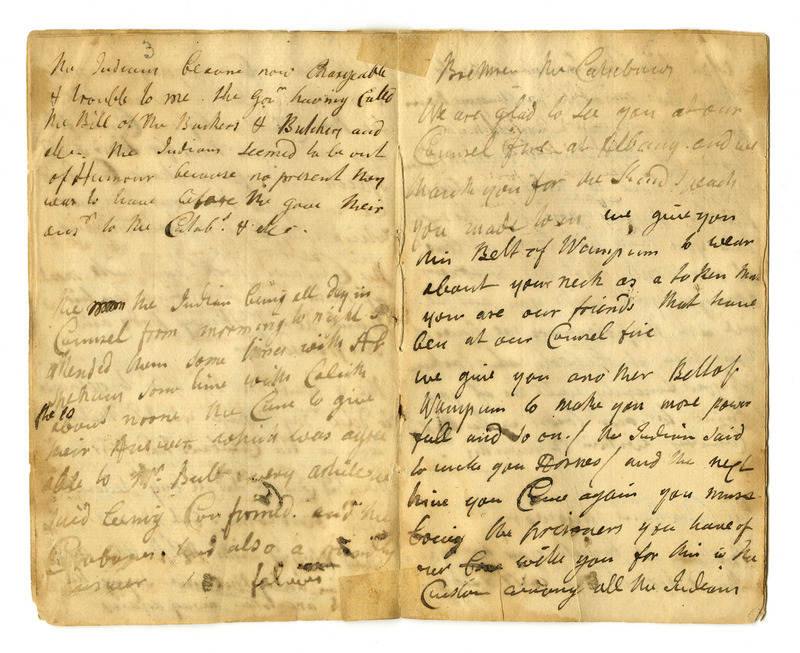 PACSCL processors Celia Caust-Ellenbogen and Michael Gubicza wrote about this letter back in March on the PACSCL processing project blog, and offered a few verses of their own composition. We’re happy for the media coverage. In case anybody is wondering, we don’t literally enforce Dr. Cox’s stipulation. But Jeffrey Ray has been a good friend to HSP for years, and we’re always happy to sing his praises.